The Ebenezer Churches of Middle Georgia were privileged this past weekend to have our Fellowship Meeting once again. This year, Oak Grove PBC hosted the meeting, and it was a rich and wonderful time in the Lord. He smiled down upon us again and again, and many of the saints said that weeping seemed insufficient. The Lord blessed ministry from many different states to come visit with us, and many commented that the singing this year seemed better than usual. Each portion of the service was filled with Holy Ghost power. This year we were particularly favored to have the meeting weekend extended by the willingness of some brethren to “stay a while” with us. Elder Ronald Lawrence came in early for the meeting and filled an appointment at Pleasant Plains PBC on Wednesday night, and Elder Steve Jackson, Elder Tom Griffin, and Lic. Jeb Owen stayed on after the meeting. This allowed for appointments for the brethren with Elder Steve Jackson preaching at Trail Branch PBC on Saturday night and back at Oak Grove PBC on Sunday Morning. 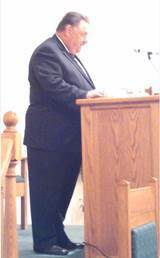 Elder Tom Griffin preached at Pleasant Plains PBC on Sunday morning, and Lic. 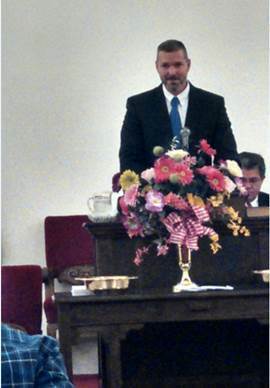 Jeb Owen preached at Trail Branch PBC Sunday morning and Cool Springs PBC Sunday night. The brethren’s willingness in this regard made it seem like the meeting was extended though it officially was from Thursday night through Saturday morning. We rejoice brethren that our risen Lord is still manifesting His power through the efforts of men in His house. Each service was a powerful testimony that God is alive and furthermore that He is not through with His people. With revived hearts, refreshed spirits, and an energized walk, the brethren in the area have been strengthened and emboldened in the Lord once again. Pray for us brethren that our mutual Lord would continue to bless this area and that our lights would burn brightly and fervently for His name’s sake. I apologize for the quality of the pictures as technology did not cooperate with me this year. Many of the pictures taken did not even come out. The sermons will be posted to our website at: coolspringspbc.org. Preaching: Elder Ronald Lawrence (Nashville, TN) – “The Effectual Fervent Prayer of a Righteous Man Availeth Much” Brother Ronald beautifully expounded on the nature and manner of successful prayer. He charted through several examples ending with the ultimate example of prayer in the Person of Jesus Christ. Preaching: Elder Steve Jackson (Ft. Smith, AR) – “Ephesians 2:1-10” Brother Steve brought out the rich, timeless truths of God’s mercy, love, and grace to a people whose state did not merit or deserve it. Preaching: Elder Ronnie Loudermilk (Lula, GA) – “Isaiah 52” Brother Ronnie described the condition of Zion coupled with the prophecy of the coming of Christ. Preaching: Elder Ricky Myers (Brookhaven, MS) – “Jehovahjireh” Brother Ricky started in Genesis 22 and showed the Lord’s provision and blessing through the work of His Son. Preaching: Elder John Scott (Statesboro, GA) – “Lovingkindness” Brother John brought out the covenant blessing that we have with the Lord through this term. Preaching: Elder Sam Bryant (Birmingham, AL) – “Fear Vs. Faith” Brother Sam described how faith dispels fear and that nothing in life is worth fearing due to the work of Jesus Christ. Introduction and Prayer: Lic. Jeb Owen (Lockhart, TX) – “One Thing Have I Desired” Brother Jeb used Psalm 27 to show the Lord’s house as our top priority in life. Preaching: Elder Craig Lanier (Metter, GA) – “Looking Up To Heaven in Church” Brother Craig used Revelation 4 (and some context) to describe the beauty of heaven from the church’s perspective. 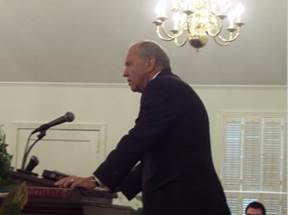 Preaching: Elder Bill Torrence (Vidalia, GA) – “Basics of Theology” Brother Bill showed the building blocks of theology from Romans 8:28-30. Preaching: Elder Lonnie Mozingo, Jr. (Magee, MS) – “Hast Thou Considered My Servant” Brother Lonnie started with Job’s case and steadfastness in adversity and then transitioned to the ultimate Servant Jesus Christ and His steadfastness in adversity. Preaching: Elder Danny Parker (Danville, VA) – “Preservation and Perseverance” Brother Danny showed the difference between the two concepts and the ultimate importance of both in their place. Preaching: Elder Tom Griffin (Meadville, MS) – “Reigning and Putting Down Enemies” Brother Tom started in I Kings 2 showing Solomon’s putting down of his enemies and the peace that it brings correlating that to Christ putting down His enemies and bringing peace. Preaching: Elder Chris Crouse (Plant City, FL) – “3 Bodily Appearings of Christ” Brother Chris showed these appearings from Hebrews 9 and showed the importance of all three. Preaching: Elder Ronald Lawrence (Nashville, TN) – “Great” Brother Ronald described the true meaning and usage of the word from Scripture, showing that the Lord and His work is what really merits the usage of the term. Preaching: Elder Steve Jackson – “Evidences of Salvation” Brother Steve travelled through the book of I John showing how we see evidences of salvation that are meant for personal comfort and strength. Preaching: Lic. Jeb Owen –“The Doctrine of the Lord” Brother Jeb described the foundations of our belief from Deuteronomy 32 showing our condition and ability contrasted against the will and power of the Lord. Preaching: Lic. Jeb Owen – “The Resurrection” Brother Jeb started in Luke 24 on the road to Emmaus showing what the revelation of Christ’s resurrection does for us and our spirit.